I do confuse easily, however. Every time I think I've got this computer stuff down, something changes! The home computer started acting really funky yesterday and it was time to reinstall windows. This always scares me. Yeah, everything can be reinstalled but often, programs are updated and I have to relearn them and change how I do things. I use Microsoft FrontPage to publish this site. But now, I have the new, updated FrontPage 2003. The problem is, I'm having a heck of time figuring out how to do everything. In fact, when I first fired up the program, I couldn't even find the site! Panic time! I've found it, although I'm not sure how! Also, none of the fonts are showing up as they did before. I'll have to work on that later, though. So, if I disappear, you'll know that I'm just fine. I'm just confused! A hearing-impaired coworker asked me if Amadeus will be interpreted for the deaf. When I said no, she indicated that she could bring people to see it if it were interpreted. 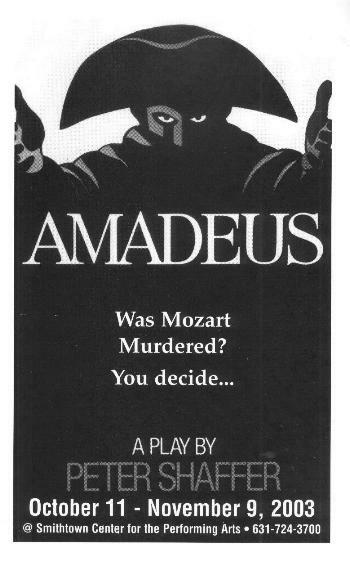 Well, the wheels started turning and before you knew it, Sue Carey and I had signed on (no pun intended) to interpret Amadeus on Thursday evening, November 6. Information for the production can be found in an earlier entry (see below). We don't have much time to prepare but if we can bring in an audience, we may interpret other productions. Thank goodness for warmer weather! The football game this morning was just fine since there was sunshine and warmer temperatures. Two more weeks and two more games await us. It would be nice if the weather holds out just a little longer. I got a new toy today, a beautiful new scanner! The old scanner was probably five years old. This new one (epson perfection 1670) is much faster and also includes an attachment for scanning negatives and slides. I won't have much time to play with it for the next couple of weeks but I am looking forward to trying the attachment and features of the software. Holy cow, I was not happy and they do NOT pay me enough to stand out there in 40-something degree weather (with wind gusts up to 24 mph, I might add) for two and a half hours. You would not believe how bundled I was. I was prepared for the arctic: turtleneck shirt, sweater, hooded sweatshirt, winter coat, knitted headband (made on my trusty knitting machine), fleece gloves, jeans AND sweatpants over the jeans, two pairs of socks (including super-thick socks from Old Navy), my Nikes. I was actually doing ok except for my feet. They were absolutely frozen. The trainer came by in his little golf cart. I said, "I am not happy!" He said he didn't blame me and complained of the cold. I mentioned my feet were frozen, "and I have two pairs of socks on." He said, "Yeah, it doesn't help. Socks are highly overrated." It doesn't matter how bundled you are, if you're out there on an open field with no protection from the wind, you're cold. I felt so bad for the players. They did a lot more running than usual just to keep the blood circulating. I'm too much of a mom. I want to baby them too much. They are football players, you know. They're tough as nails, they're killers! Grrr! I don't know. I just can't buy into this football mentality. I'm sorry but I see them as ninth and tenth grade boys, shivering with chattering teeth! I see by the weather report that it's supposed to warm up a bit, in the 50's tomorrow and near 60 on Saturday, when we have a game. It will feel like a heat wave. These coaches are real comedians. They tell me I'm part of the team. I believe it. They tease me as much as they goof on the kids. This weekend is the time change so I asked what will happen next week. Practice usually ends around 6pm but after Sunday, 6pm will look like 7pm now and it will be dark. They're giving me, "Oh, no, it will be the same time." "But, it will be dark." "Yeah, we'll bring the cars up and shine the headlights." Hmm, yeah. So, I said, "Come on, guys, I'm serious. I have to tell this kid's mom when to pick him up and I can't leave until he's picked up!" They conceded practice will end earlier but didn't give me an exact time. The earliest Mom can get there is 5:30. I said that's just fine. If they're done around 5pm, we'll just wait inside the school and stay warm, fine with me! Have I mentioned how I just love my job? Sigh. I added a link for horoscopes (or "horrorscopes" as some people refer to them) on the home page. You never know. Maybe you're into that kind of thing! My schedule is more normal this week but I'm still trying to catch up on chores I didn't have a chance to do and sleep I didn't get. Maybe this weekend will help! The guy sure looks like plant food to me! Had lots of fun today! It was great fun meeting Eileen and Kathy after corresponding for quite a while now. The weather was an improvement on the rain of last night and seeing the show from the balcony was a different experience. The effect with the plant at the end feels so close from the balcony seats. I also found it easier to see the working of the plant and how the puppeteers are situated from that angle. Pretty cool! It's been a very busy week. Now, there's an understatement. I appreciate extra work hours (and the extra pay they provide) as much as the next person but all in the same week? I worked more hours in the past week than I usually work in two weeks. Yes, I'll be happy when this paycheck is deposited but I feel like I've been running in circles and haven't had a chance to take a breath. Also, I had plans for last night and today and I'd like to be awake! 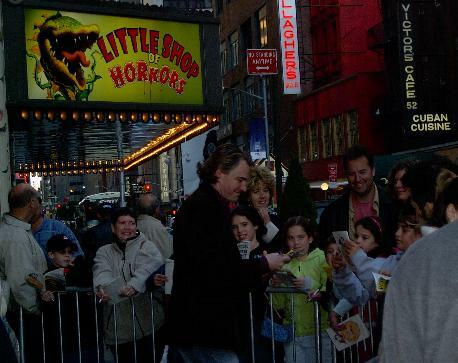 The plans involve Little Shop of Horrors, which I will see for the second time today with leaguers Kathy and Eileen, visiting from Utah. I'm anxious to see the show again since we saw it in previews. Fall weather is creeping in. I'm starting to notice the leaves changing colors. I do like the change of seasons but every year, I think I feel the cold a little more. Football will be a bit chillier from now on, I suppose. Yesterday's evening game under the lights was a bit cold after the sun went down. It's been busy busy around here lately but Bill and I saw Kelly on stage Saturday night in a non-speaking role in Amadeus at Smithtown Center for the Performing Arts here on Long Island. It actually amounts to moving a chair on and off stage, as well as joining crowd scenes but she'll also understudy another non-speaking role several times during the run, which ends November 9. She's also handling wardrobe duties and the costumes are amazing. They're all brand new, made specifically for this production. The play is absorbing and it's a very polished production. I enjoyed it quite a bit and I'd highly recommend it. On this day in 1847, Jane Eyre is published by Smith, Elder and Co. Charlotte Brontë, the book's author, used the pseudonym Currer Bell. The book, about the struggles of an orphan girl who grows up to become a governess, was an immediate popular success. Brontë was born in 1816, one of six siblings who grew up in a gloomy parsonage in the remote English village of Hawthorne. Her mother died when she was 5, and Charlotte, her two older sisters, and her younger sister Emily, were sent to Clergy Daughter's School at Cowan Bridge in Lancashire. The cheap school featured bad food, cold rooms, and harsh discipline, all reflected in the image of the boarding school portrayed in Jane Eyre. Lots of new links on the Little Shop page, reviews and opening night photos. Although I've looked at the photos, I haven't had time to read the reviews yet. I'll probably have to wait until this evening, too busy right now. So, I can't comment yet. It's 42 degrees! What the heck happened to fall?? It was cold on the football field yesterday afternoon, especially with gusts up to 30mph. I did have gloves and a jacket but I'm bringing warmer things today. I hope it will warm up a little before it stays this way. It wasn't long ago that I was complaining about the humidity. Pooh is all ready for Halloween but you and I know we have a whole month to wait. I guess Pooh's a little impatient. I know Halloween has always been one of my favorite holidays to celebrate.